This is an overview of how the legal system works in King County, for family law and divorce cases. This is just an overview; if you are trying to do a case, this will be helpful, but do not depend on it for everything. The links to King County Superior Court and to the State’s Website are in my Resources section. You will also need to read the King County Local Family Law Rules and you can find more advice in the King County Family Law Section. New Cases. When you initially file a divorce, or any new action, you need a Summons, a Petition, and some other files, depending on what kind of case you are filing. I have attached samples of these here: Murry – King Cty Sample Divorce. These are examples; they are not guaranteed to work for your case. The forms are also on the State Website; but as you can see, they are not user-friendly. If you are filing them in person, take a copy along with you; you will need to stamp it at the clerk’s office with the case schedule. When you file the case, the clerk will assign a case number. That number looks like this: “16-3-12345-1 SEA”. That is the number the clerk’s office will use to track your case forever after. Just filing the case does not start the divorce, legally, You still have to serve it on the other side. If they are cooperating, they may well sign an Acceptance of Service. (Here.) If not, you will need to have them singed. You cannot serve them; but anyone else can. (Friend, neighbor, mother…) You can serve anyone living at the place the other side is living in; or you can have them served personally. A Return of Service form is attached here. You need to file that form with the court when they are served. 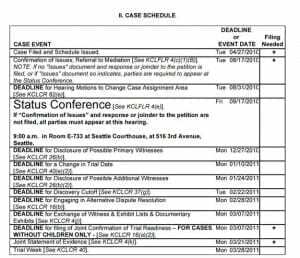 Also, when you file a divorce in King County, the court clerk automatically issues a Temporary Restraining Order, similar to the one used in Snohomish County. These are issued in every divorce. This only deals with financial restraints, and not with use of cars, the children or child support. 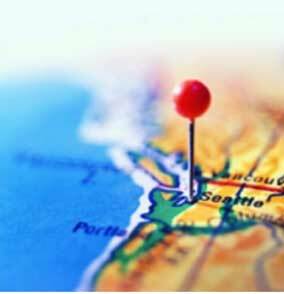 A King County divorce – or any action, for that matter – does not formally, legally start until it is both filed and served. If it is a divorce, the 90 day clock starts to tick the later of the filing date or the service date. Once the case is filed, King County has a pretty good case management system. The clerk assigns a judge when they issue the case schedule. The case schedule has a number of suspense and other dates (below), when you have to have things done by. If I am your attorney, I handle this for you. If you are doing the divorce by yourself, then you need to be careful to read the rules. AND you really, really need to attend the Family Law Orientation Seminar. If You Don’t Have An Attorney. 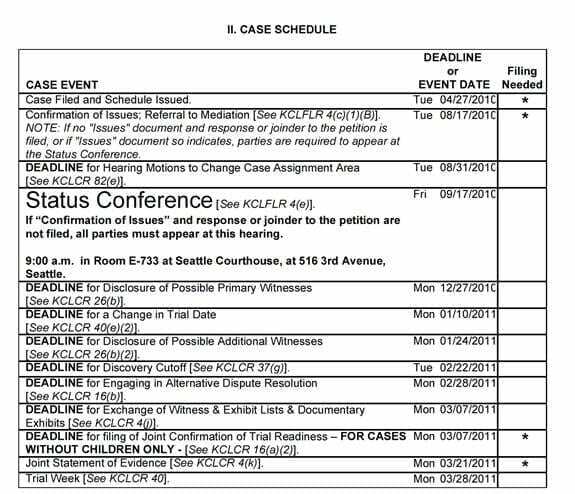 If you are not represented, the King County divorce process requires that you go to a 4 hour seminar (called the Family Law Orientation Seminar) on how the process works. There is a fee for this seminar ($20), and you have to go in the first 30 days. If you have an attorney (like me), then you do not have to go. If you do not go, there is a $30 fine that King County sends you a bill for – but it does not hold up the divorce. The seminar page is here. If you have children: both parents need to go to a parenting seminar, as part of the King County divorce process, called What About The Children. You need to go before the Confirmation of Issues deadline. This is a low fee, but paid, seminar. It lasts about 4 hours. Disclosure of Possible Primary Witnesses. List everyone you can think of who you might want to testify at trial. This is filled out by both the Petitioner and the Respondent. If you do NOT disclose witnesses, the court can deny them testifying at trial. (Which is why you list everyone you can think of, on both sides. You may never call any of them; but you want to make sure they are listed.) You need to file it with the court, AND give the other side a copy. Deadline for Discovery Cutoff. Any discovery you send out, has to be due back by this date. Deadline for Engaging in Alternative Dispute Resolution. Otherwise called mediation or a settlement conference. King County (like Snohomish County) requires that everyone in a divorce go through mediation before going to trial. This is different from Family Court Services mediation; that only addresses the parenting plan. You can hire a mediator; or you can use the King County Volunteer Panel. (Here.) Most divorces settle without going to trial. But if you do settle it, you will sign something called a CR 2A Agreement; and you can’t then back out of the agreement. So (1) go into mediation with the entire list of all the issues; and (2) be prepared to live with any agreement you come up with. Courts do NOT like to let you out of a signed Agreement. Deadline For Exchange of Witness Lists and Exhibits. This is the date by which you have to have the list of witnesses that you actually plan to use, and a list of exhibits, to the other side. (These are from the witness list you filed earlier.) You need to supply complete, legible copies of all the exhibits as well. A sample Witness and Exhibit List is attached here.